How are albumHeigth and albumWidth calculated? My PhotoSwipe skin and Slide Show 4 skin are both responsive, so the size of the index page depends on the device and the chosen thumbs configuration. Could some body give a more extended definition as given in this table? Re: How are albumHeigth and albumWidth calculated? Those variables aren't calculated, they are entered by the user when using the embed feature. This by default creates an iframe of that specified width and height. If your album is truly responsive, then just use these values as layout hints. But how are the defaults for these two text boxes calculated? Is it possible to get as initial defaults maxImageWidth and maxImageHeight, which are the best values for a slide page (but not for an index page)? Please give more details how to do that. to init.bsh or to embedd.htt? BTW, I haven't even looked at this in a few years. 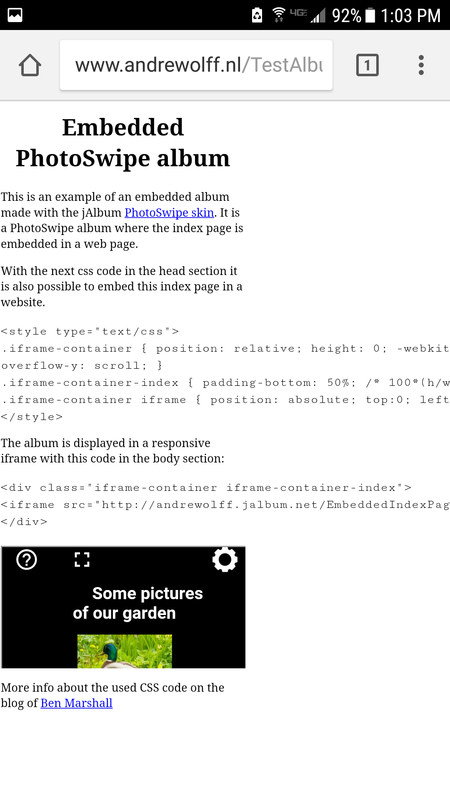 Because iframe embedding is such a bad idea for most skins, this whole "embedding" thing is probably best ignored. It's in Matrix, but I never bothered with it in Gromit, the newer skin. 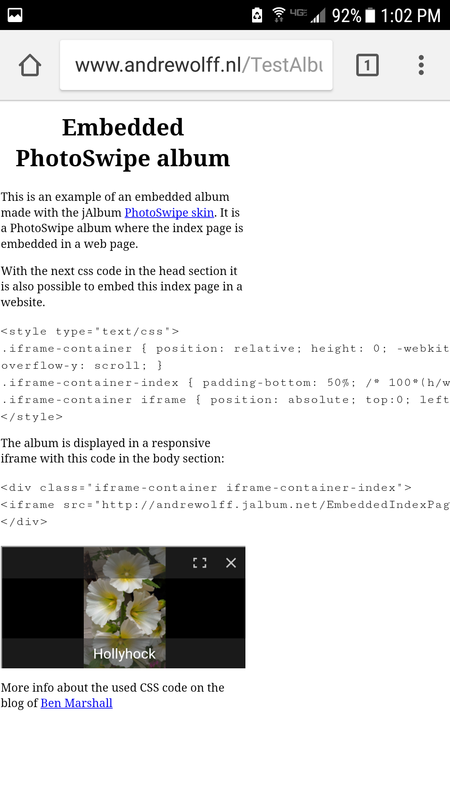 IBecause iframe embedding is such a bad idea for most skins, this whole "embedding" thing is probably best ignored. It's in Matrix, but I never bothered with it in Gromit, the newer skin. With css you can get these day reasonable responsive iFrames, see here and here for examples. Well, Mr. "Mobile First," I have to assume that you've never tried viewing those pages in Chrome on a Android (probably the most common phone/browser combo in the smartphone world). They are, frankly, a bit of a mess. Well I must admit I am more an iOS fan, so that is my standard mobile platform. But I do test my skins also on an old Android tablet, where this page looks good, see attached screenshot. On iOS your http://www.andrewolff.nl/TestAlbum/Embedded_PS/indexpage.html slide images do not resize properly in portrait mode - iPad Pro (small). See screenshots. The index page is almost unusable. Well you did test it on the small screen of a mobile Phone. I have the same type of display on an iPhone, see enclosed ..6448 screenshot. And it looks also better in portrait mode if I remove the displayed code. It is no problem on my iPad, see enclosed screenshot. The problem was not caused by the iFrame, but due to a div around the css code. This div had a width of 1200 px, not very good for a small mobile Phone. I did correct that and now it looks Ok even on a Phone in portrait mode, see enclosed screenshot.